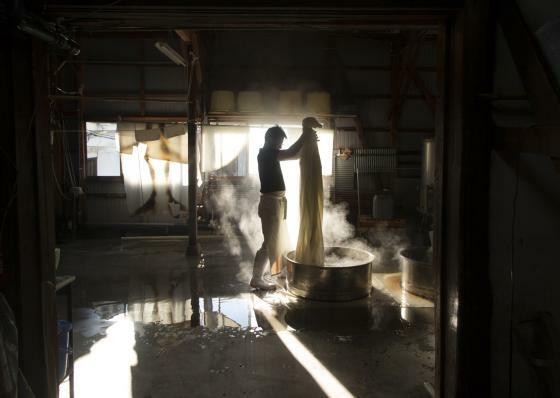 The clear light that illuminated the inside of each sake brewery at that time of day was the magical catalyst that every backlit human movement and endowed each piece of sake-brewing equipment with a life of its own. It was particularly true of Fujii Shuzo in Takehara, a small 153-year-old artisanal brewery whose Ryusei brand consists only of junmai sake made from Yamadanishiki, Omachi and Hattan Nishiki rice and high quality local water. Of course every link in the production chain is important, but few are more critical than the rice steaming, because there are three separate destinations for the steamed rice and each is vitally important to the finished product. The lions’ share of the steamed rice, the kake-mai, goes to the main mash, or moromi. 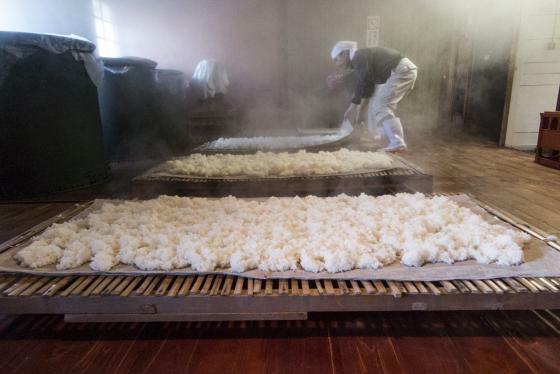 Between a fifth and a quarter of the steamed rice goes to make koji, i,e. rice infected with the koji mould to convert its starch to fermentable sugar. A small amount, less than 10%, goes to the preparation of the yeast starter, the shubo. Before the rice is steamed, it has to be washed and steeped. The importance of the washing process was etched into my memory following a visit to the Dewazakura Brewery in Yamagata couple of years back. In front of the local press, our little group had been allowed, exceptionally, to hand-wash some rice. Each of us was assigned a small baby-swimming pool-sized washtub and we all balanced our mesh buckets full of rice on the rim awaiting the signal to lower them into the cold water. Whether it was an excessive intake of sake at lunch I’m not sure but or some inexplicable reason, instead of dropping my bucket, I tipped the rice into the water. Cue consternation followed by much hilarity followed by some embarrassing publicity. As I discovered once the process was re-started and my right arm almost froze off in the 4°C water, the washing removes the powder that clings to the grains after the polishing process. Most rice is washed by machine, but rice for premium sake such as ginjo is still rinsed by hand in small containers and it has to be done carefully to ensure that the rice grain doesn’t split or crack. Most importantly, the aim is to allow the rice to rehydrate and absorb a certain amount of water. 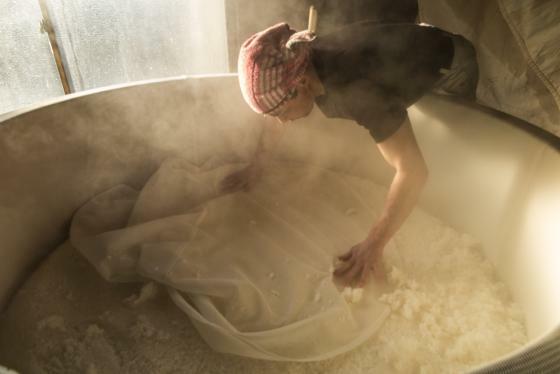 Once the rice has been washed and steeped to the desired moisture content level, it’s transported next day to the steamer in a process known as jo-mai. 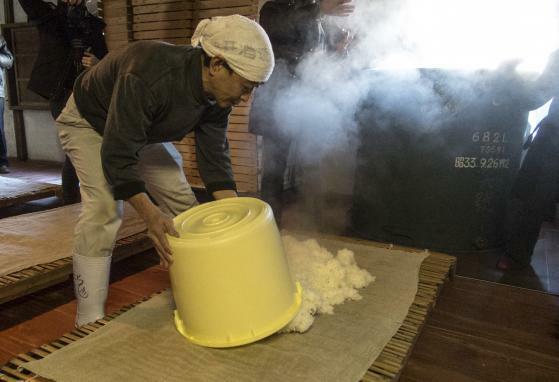 The point of steaming is to prepare the rice for fermentation by making it more soluble. When it’s steamed, the rice becomes stickier and its flavour begins to be unlocked. 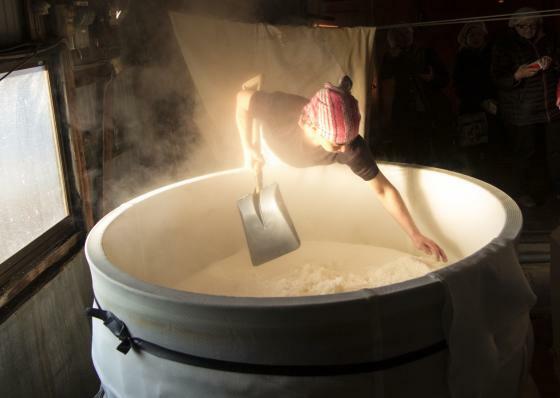 The rice is transferred to a large tub, a koshiki, traditionally made from Japanese cedar wood, although most sake is now made in a metal container to make the process more streamlined. 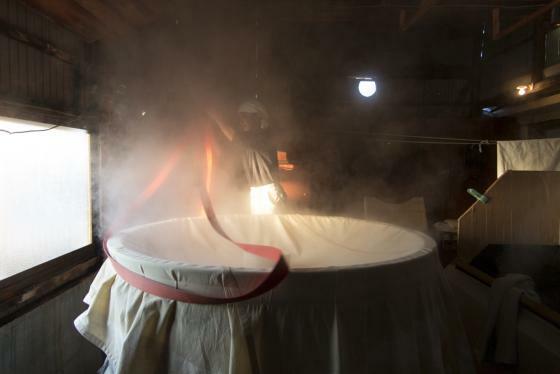 During the steaming process, which takes up to an hour by the traditional method or half that time in a rice-steaming machine, water absorption expands the weight of the rice by some 10%. Once steamed, the sticky rice is kneaded to make sure it’s reached the desired consistency, a result known as hineri mocha. It’s checked for the right texture which is in essence a combination of elasticity, hardness, translucency and the right smell. 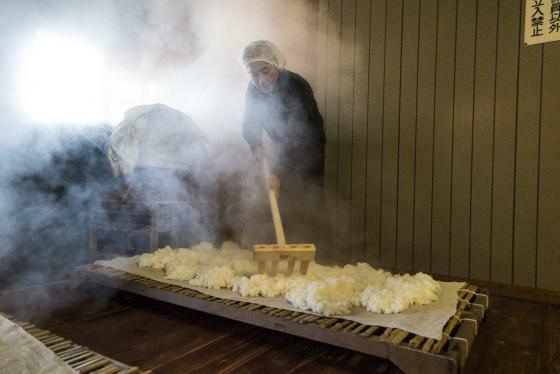 When the toji, the head brewer, is happy with the consistency of the steamed rice, it’s divided as to roughly four-fifths, the kakemai, which is cooled and then destined for the main mash, one fifth to a quarter that heads to the koji room and a small quantity, the shubo-mai, that goes for the preparation of the yeast starter. As it turned out, with its luminous light and peaceful movement, the steaming hour was the best hour of the day – until sake o’clock, that is.